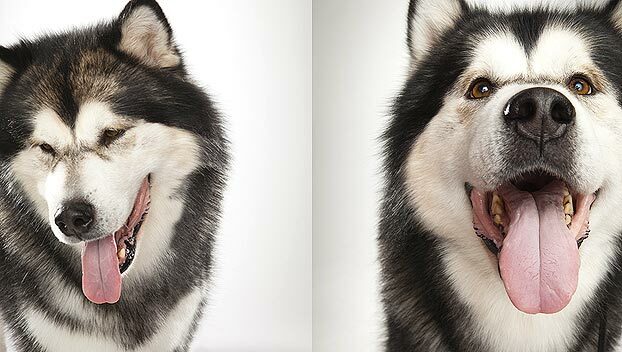 Is the Alaskan Malamute right for you? Find your perfect match now! Alaskan Malamutes are the original Arctic explorers. Created by the Mahlemut, an Indigenous People of the Pacific Northwest coast, the first Alaskan Malamutes worked as hunters and sled dogs. Devoted, fearless, and built to go the distance, this breed accompanied Admiral Byrd on his 1911 trek to the South Pole. Originally from the territory we now know as Alaska, this large and moderate-energy breed can grow to between 75-85 pounds and live 10-12 years. The breed is recognized by the American Kennel Club and classified as a member of the Working breed group. WHAT IS AN ALASKAN MALAMUTE'S PERSONALITY LIKE? 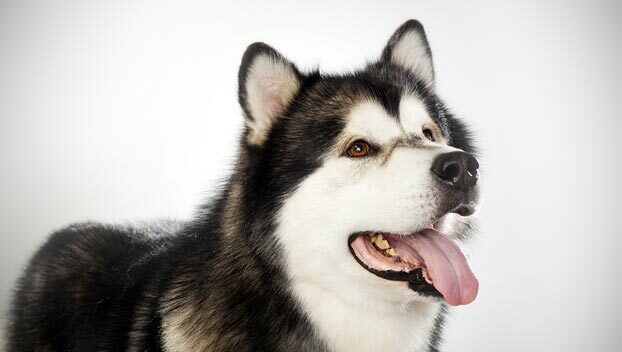 Alaskan Malamutes are fairly intelligent, very affectionate, and crave consistent exercise. They make for loyal and playful companions. WHAT IS ALASKAN MALAMUTE BEHAVIOR LIKE? Alaskan Malamutes need a lot of exercise in a fenced area. These intrepid dogs are definitely a flight risk — consider having yours microchipped incase your buddy decides to reenact the escape and, at the very least, make sure they're always wearing identification tags. 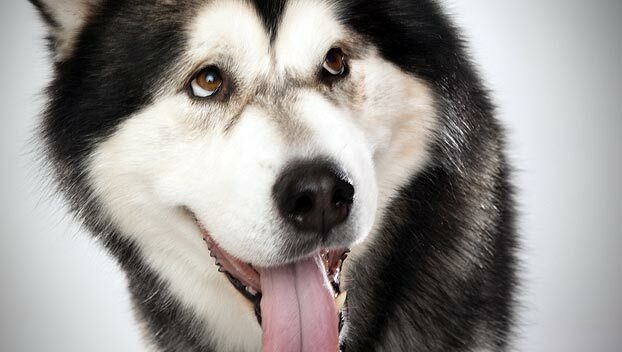 Alaskan Malamutes are not very fond of other dogs, other pets, or small animals, but they can enjoy meeting new people. This breed is family-friendly—particularly if that family loves the outdoors!— and does best in supervised play with children. They make for fairly capable watchdogs, somewhat able to protect you and home. However, keep in mind that any watchdog does her best when treated as a (doggy) member of the family. These are working dogs: give them a job—preferably pulling a heavy load—and they'll flourish. But leave them alone in the backyard and you can say goodbye to your begonias and your neighbors' good will. 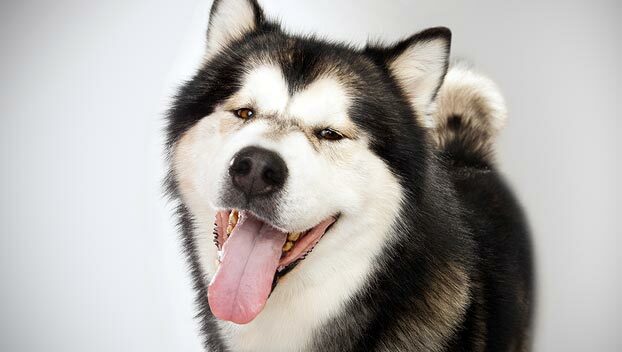 Alaskan Malamutes can be enthusiastic diggers and howlers if they're under-exercised. HOW EASY IS IT TO TRAIN AN ALASKAN MALAMUTE? Alaskan Malamutes know their own minds, and as such, they're not easy to train. You need to establish yourself as leader early. Be patient and consistent; they respond to training that uses treats and games as rewards. HOW MUCH DO ALASKAN MALAMUTES SHED AND WHAT ARE THEIR GROOMING NEEDS? These dogs are heavy seasonal shedders who need brushing at least once a week and regular trips to the groomers. Break mats apart with your fingers to prevent fungus and check your floofy friend's skin for hot spots to avoid infection. True to their name, Alaskan Malamutes have thick waterproof coats that shield them from low temperatures. Straight outer fur conceals their wooly undercoats. WHAT HEALTH PROBLEMS DO ALASKAN MALAMUTES HAVE? 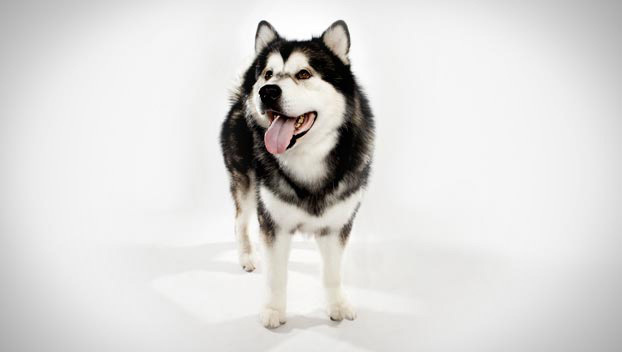 Your Alaskan Malamute is susceptible to hip dysplasia, cataracts, and potentially kidney problems. Some are also born with a condition called chondrodysplasia, or an abnormality in the length of their limbs. Responsible breeders can now test for this to see if the parents are carriers of the gene. Inherited polyneuropathy, a condition that impacts motor coordination, and day blindness can also occur in younger dogs. Feeding your baby Alaskan Malamute a growth food for large-breed puppies will slow their rate of growth, but not diminish their adult stature, and may help prevent or reduce the impact of adult-onset hip dysplasia. 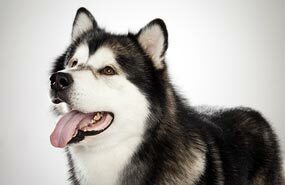 ARE ALASKAN MALAMUTES GOOD FOR PEOPLE WITH ALLERGIES? The American Kennel Club doesn't list Alaskan Malamutes among its breeds recommended for folks with allergies. WHAT IS AN ALASKAN MALAMUTE'S BEST DAY? 7am -Start with a good dig in the backyard sandbox that's just for her. 7:35am- Snow sledding? Hiking? Hauling? Yes, please! Repeat and adjust for age or body condition. SHOULD I ADOPT AN ALASKAN MALAMUTE? If you're a dedicated city- or desert-dweller not up for much outdoor exercise, or looking for a canine companion who'll fit in your purse, this is definitely not your dog. If you want a dog you can let off the leash who craves a lot of alone time, there are better matches for you. If, however, you and your active family live to run, hike, swim, and camp. If you enjoy living in the Great North Woods and having a dog who will keep you company while you build your snowman army. If you're looking for a playful, active, and loyal buddy built to move—you just might be Alaskan Malamute-tough. Have you decided that an Alaskan Malamute is the perfect dog for you? Why not be your new best friend's hero and adopt a rescue! Be sure to check out our article on what to expect when you're adopting a dog or cat.